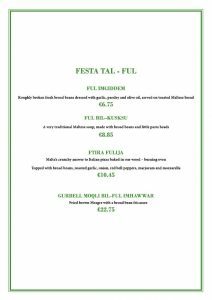 Join us at Gululu, in Spinola Bay St Julians for our ‘FESTA TAL-FUL’. Broad beans, fave – are one of the oldest recorded foods of the Mediterranean pre–dating the Pharaonic period. All around the shores of this historic sea one encounters several diverse recipes with Ful as a major ingredient, like the Egyptian Ful Medames and Maccu di San Giuseppe from Sicily. yet tasty bean to help sustain themselves and their families. With these dishes we are proud to offer true flavours of our islands.